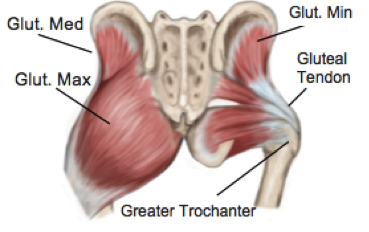 The gluteal muscles are three large muscles located at the back of the pelvis that provide most of the muscle bulk of the buttock region. These muscles work together to keep your pelvis level when standing and are responsible for many movements of the hip. They play an important role in standing, walking and running. A thorough assessment is required for an accurate diagnosis and once gluteal tendinopathy is confirmed, your physiotherapist will be able to identify which factors have contributed to your condition and help to address these. It has been shown that specific loading exercises and muscular retraining can stimulate the tendon to heal and remodel the collagen fibers into a more organised pattern again. Your physiotherapist can investigate any postural habits or activities that are contributing and address these as required.